I like to set these crazy rules for myself, then see if I can stick to them. My latest rule is “I’m not going to buy any peanut butter till after Christmas.” You see, I LOVE peanut butter. Like, love love love love love love love peanut butter. I have a couple favorite brands, all the natural kind. And I even really enjoy the fresh ground kind where I flip a switch and watch it go from nuts to paste right before my own eyes. I don’t eat the peanut butter “spread” that most people think of when you say peanut butter, but the kind that has at most 2 ingredients: peanuts & salt. I began to notice I was going through a lot of it, and I should probably cut back. So, that’s when the “No buying peanut butter till after Christmas” rule came about. Not more than 3 days after I finished the last jar of peanut butter, I had quite a hankering for some fabulous nutty spread. #1 This is ALMOND BUTTER, not peanut butter. #2 I am not buying anything. So technically, I’m not breaking any rules, right? Right. This is every bit as delicious as the chocolate almond butter at Whole Foods. No wait, this is MORE delicious. It’s basically amazing. I can’t believe I didn’t try it sooner. I think I was just afraid the Magic Bullet Blender couldn’t handle it, but it did a great job! In Magic Bullet Blender (or food processor, Vita-Mix, or whatever is strong enough) pulse almonds until well-chopped. Once well chopped blend or continue to pulse until it becomes finely ground and begins to stick together like a dry paste. Add in chocolate chips and cocoa. Blend until well combined. (At this point mine was still a dry paste that didn't hold together in a spreadable form, and wasn't moving around anymore when I pulsed the blender.) Add peanut oil, and blend until it becomes a spreadable paste. Add more oil if necessary. I kept mine in the fridge, but before I used it, I zapped it in the microwave for short bursts until it was spreadable again. And this time last year, I was enjoying some Cranberry White Chocolate Bars and Margaritas (I know, in November?). Looks delicious! I've been doing something similar with hazelnuts to make a Nutella substitute. I will have to try your almond version! You can also blend mixed nuts with vegetable oil to make a really tasty peanut butter substitute. Really, the homemade stuff is so much better than store-bought. I'm making PB for gifts this year. Going to do a vanilla version. Do you think a kitchen aid bleneder would be strong enough to grind the nuts? I'm sooo going to try this. I'm not crazy about chocolate but I think this would be an awesome gift if packaged in some of those darling little mason jars with a cute little label. Oh, wait which blade did you use for the bullet? Or I have a cuisinart blender, use it? oh YUM, this looks SO good! I feel the same about peanut butter. I'm addicted and I have secret stashes. It's crazy. 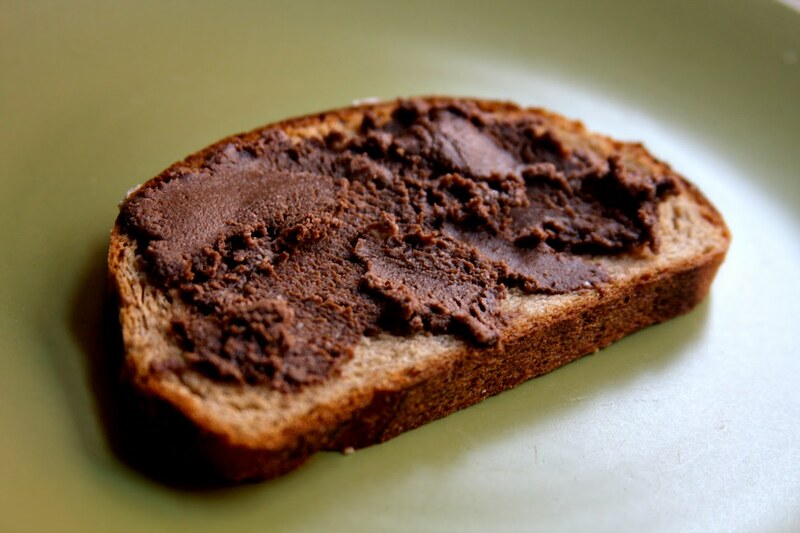 OH MY GOD…I just turned to my husband and asked….”What could be BETTER than almond butter”? He says “For you, nothing”! I just smiled and showed him this post! lmao YUM!!! And I LOVE the idea of making this for gifts!!! I have wanted to try Nutella for a long time, but after reading the label, was discouraged. It really isn’t very healthy at all, with so many additives. Needless to say, I was THRILLED to find this recipe. Thank you so much! I cannot wait to prepare this!